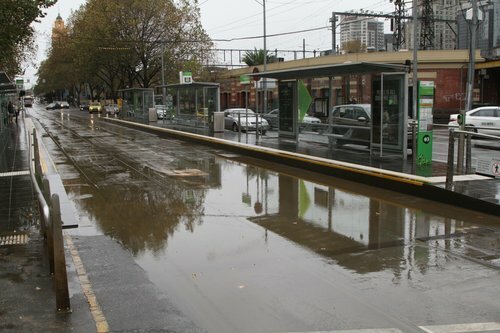 On 29 December 2016 a sudden thunderstorm hit Melbourne, resulting in flash flooding across the city, and the usual disruptions to train and tram services. The tram tracks at Southbank flooded as they always do – the entire area is virtually at the same level as the Yarra River, so the water has nowhere to go. 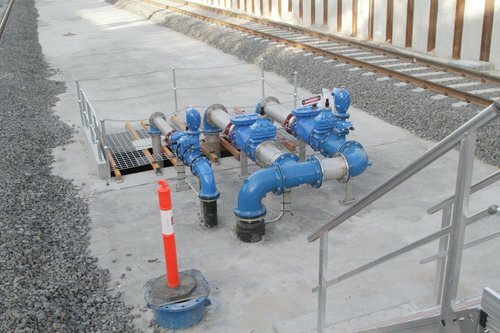 Pedestrian subways are another usual flooding suspect in Melbourne – with the underpass at Broadmeadows station being one example. The subway at Oakleigh was another. But tracks at low lying railway stations also ended up underwater. This was Prahran. Over at Keon Park station a train stopped just in time to avoid ending up in the drink. But over at Ivanhoe a train was caught in the middle of it. At least the brand new train trenches on the Franskton line didn’t flood. Thanks to the massive sump pumps at each station. Did you notice how almost every photo I linked to above are portrait format? Just goes to show how the average person uses their smartphone, and explains the plague of vertical videos on the internet. Protective Services Officers – towards a surveillance state? The College Lawn Hotel in Greville Street has a fantastic, period photograph of a steam engine at Prahran station, deck deep in water. Worth checking out if you’re in the area. This would be the photo? So how are the sensors in phones? Are they square or landscape or portrait?